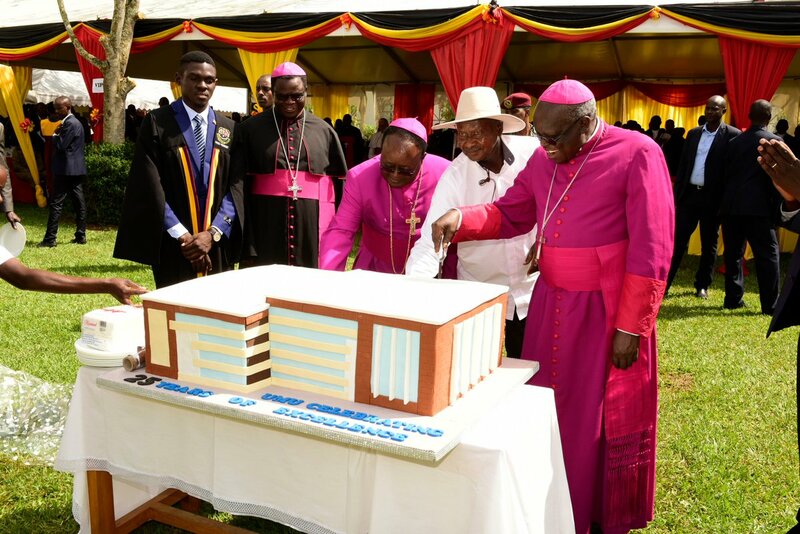 KAMPALA- President Yoweri Museveni has donated Shs520 million towards supporting several projects at Uganda Martyrs University Nkozi and praised the role played by faith-based universities in training and impacting knowledge relevant to the needs of the society. Of the 520 million shillings, Shs.400million was a contribution towards constructing a proposed silver jubilee complex worth Shs.16billion to be built at Rubaga Campus, Shs.100 million to Equator Project for the university’s alumni association, and Shs.20million to the university community SACCO. Mr Museveni made the donation on Friday as the university celebrated 25 years of existence in a function held at the university main campus in Nkozi, Mpigi District. The President said that the idea of starting faith-based universities started way back in the 1990s. However, he said government had resisted the idea back in days when Muslims requested to set up a faith-based university in 1979. Museveni said being that the idea was mooted by the then president Idi Amin after dragging Uganda into the Organization of Islamic Conference (OIC), and that being Uganda was not an Islamic state, this had to be reconsidered by the new leadership after ousting Amin. “Afterwards, the cabinet allowed the university to start on conditions that it could be open to all denominations and have their course evaluated by the National Council of Higher Education,” he said. Kampala Archbishop Cyprian Kizito Lwanga praised the government for bringing people into the country, which he said had allowed development to thrive. The University Vice Chancellor, Professor John Chrysostom Maviri, thanked government for its continued support towards the university both in funding and development of infrastructure. He says that after celebrating silver jubilee the university now will put its emphasis on renovating and transforming higher education by offering more quality programmes. As a way of achieving the objective, the university launched new 16 programmes, added to the other existing range of creative diploma, degrees and doctorate courses, all designed to cater to the public needs.